CB Insights More Probability. Less Punditry. We build software that predicts technology trends. While the US accounts for nearly two-thirds of all drone investment activity, there are at least 11 other countries making bets in the space. Since 2012, private drone companies have raised over $1.6B across 300+ equity investments. Drones make up the second largest sub-category in IIoT (Industrial Internet of Things) and account for roughly 20% of total deal activity. Three of the earliest private drone companies and largest in terms of total funding are 3D Robotics, Airware, and RedZone Robotics. While they lead in the US, expanding internationally has been a challenge because of the complex international regulatory environment, both at country and local levels. 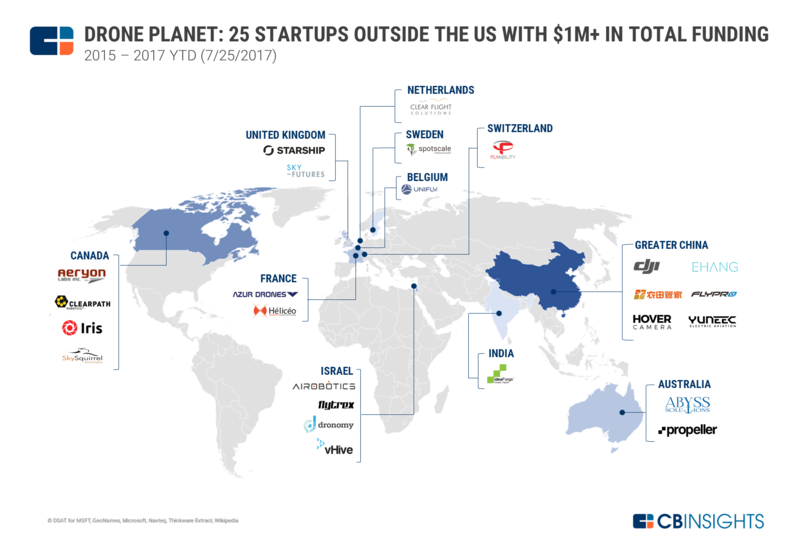 But the market opportunity outside the US has attracted a number of new, early-stage (seed/angel or Series A) drone companies, many of which have launched in different markets that span across at least 11 countries outside of the US. 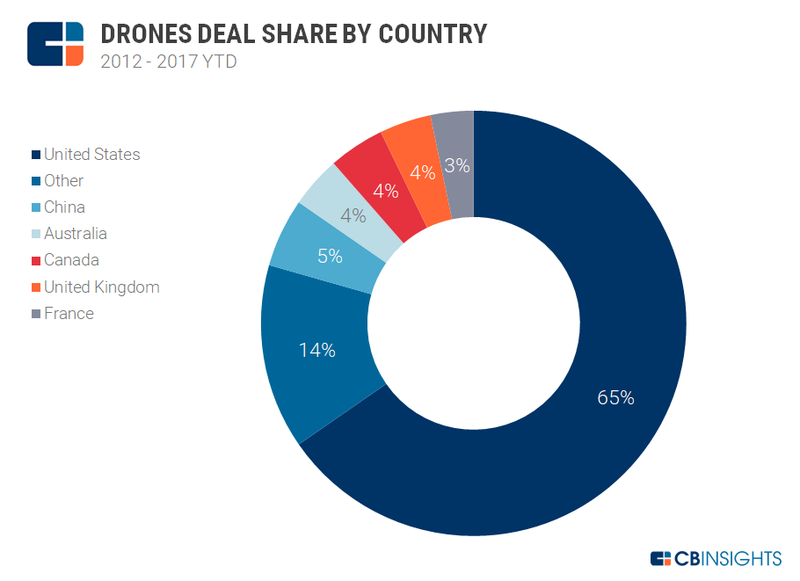 US-based drone companies have received approximately 65% of the global deal share since 2012. China took second with 5%, followed by Australia, Canada, and the UK with 4%. France followed close behind with 3% of global deal share. The two largest drone deals outside the US went to Chinese drone manufacturers DJI Innovations and YUNEEC. DJI raised a $75M Series B in Q2’15 from Accel Partners at a valuation of $8-10B. The company had formerly raised a $30M Series A in Q4’14 from Sequoia Capital China at a valuation of $1.6B. YUNEEC raised a $60M round from Intel Capital in Q3’15. The third and fourth biggest deals went to US-based 3D Robotics. It raised a $50M Series C in Q1’15 (followed by a second $14M tranche in Q2’15) and a $53M Series D in Q2’17. Smart Money investors Foundry Group and True Ventures participated in both rounds alongside a number of other investors. In the map below, we identified private active drone companies outside the US that have $1M+ in total disclosed funding and that have raised an equity round since the start of 2015. The most well-funded drone company outside of the US is Chinese-based DJI. The company has raised $105M in total disclosed funding from Accel Partners and Sequoia Capital China. The top global drone deal was a $75M Series B investment in Q2’15 to DJI that included Accel Partners as the sole, disclosed investor. Approximately 75% of deals outside the US were early-stage deals (seed/angel or Series A). The most well funded early-stage company outside of the US is Chinese-based Zero Zero Robotics, creator of the portable, autonomous flying Hover Camera. The company has raised nearly $25M in total disclosed funding to date from IDG Capital and ZhenFund, among others investors. When combining total funding of all private drone companies within a country, China is far and away the most well funded with nearly $262M in collective disclosed equity funding since 2015. Canada falls second with just over $90M, Israel third with close to $37M, and the UK took fourth with a mere $37.56M, across the same time period. Drone activity currently spans 4 of the 7 continents, with Europe having the most active countries.